I filed an amendment Tuesday to the Economic Development Administration reauthorization bill that would halt the proposed listing of the Sand Dune Lizard to the Endangered Species List. His amendment would exempt the Sand Dune Lizard from the Endangered Species Act. The proposed listing could shut down oil and gas production in parts of West Texas and Eastern New Mexico for two to five years. With reptilian ability, the Obama Administration changes its colors on domestic energy from one day to the next based on the political environment. Though the President recently claimed he was all for expanding domestic energy production, to see his true colors, meet a little-known species: the Sand Dune Lizard. If the Obama Administration has its way, this scaly political pawn will land on the Endangered Species List, without sufficient supporting research to back up the move, and effectively bring new and existing oil and gas production in parts of Texas and New Mexico to a screeching halt. I hope my colleagues will see this for what it is - a purely political move to score points with radical environmentalists that could end up causing irreparable harm to American jobs and our ability to reduce our dependence on foreign oil. The US Fish and Wildlife Service (FWS) has proposed adding the Sand Dune Lizard to the Endangered Species List. In their proposal, as recorded in the Federal Register, the FWS acknowledges deficiencies in their understanding of the lizard’s habitat and the impacts of natural events and human activities on the habitat of the species, yet they are moving forward. For example, in the FWS proposal it is stated: “We are currently unable to determine which areas meet the definition of critical habitat because the location and distribution of physical and biological features that may be considered essential to the conservation of the species is not sufficiently understood at this time. 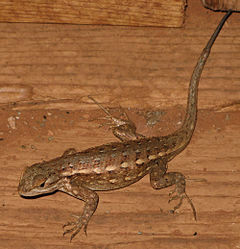 Additionally, much of the lizard’s habitat is on private lands that have not yet been studied. Finally, the Board of Regents for the University of Texas System, which manages more than 2.1 million acres of land in Texas, including 75,000 acres that could potentially be designated as habitat for the Sand Dune Lizard, have written to FWS stating the proposed listing is “at best premature and currently unsupported in law and fact. The proposal is based on faulty science, inadequate data, and seriously erroneous assumptions. Related Content: Who Will Win The Sand Dunes Sagebrush Lizard Or The People Of Texas? !